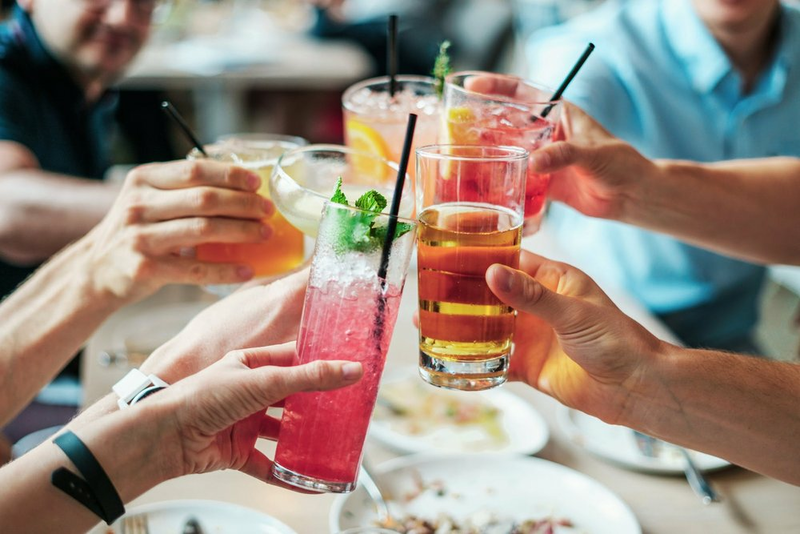 Whether you are trying to beat anxiety or are just trying to live a healthier lifestyle, alcohol needs to be addressed. If you’re reading this, booze is probably a constant in your life right now – and just like me, it might be the main way that you socialize. In a bid to see if alcohol affects my anxiety, I’m embarking on a dry challenge – that’s 30 days of no alcohol. I’m writing this on Day 2 of this challenge, after a booze-filled week in which my best friend came to stay. Sure, it was a great week and I had a lot of fun, but the healthy life I'm trying to create took a hit because of all the booze. My morning routine and self care rituals disappeared, my productive early mornings turned into groggy lay-ins and I stopped exercising altogether. I don't know if you feel the same, but I think it's hard to maintain a healthy lifestyle when you binge drink. I'm not one of those people that has one drink and goes home, given the chance I'll try to drink the bar dry. It's very disruptive to be honest, but I know this is reality for many of us in our twenties. And, we haven't even talked about the anxiety-inducing hangovers yet.. I mean, I can't be the only one who get 10x more anxiety on a hangover? That's why I feel like I need to take a break. But will I survive the 30 days? I'll be writing this article over the 30 day period, documenting my struggles and realizations! It's day 6 and my first weekend without alcohol. On a typical Friday or Saturday night my boyfriend and I would go to a bar for beers and cocktails, and maybe end our night with a falafel wrap. So how are we going to socialize this weekend? A night-in watching documentaries! To be honest, I don't even want to drink this weekend. I'm still somewhat groggy from last week (I'm 25 now and my recovery time is days longer). So far, so good. I'm back on track with my early mornings and self care, too. Day 11: I'm more than a week into the Dry 30 Challenge and today is my boyfriend's birthday. In the past, I don't think I've ever celebrated a birthday without rum, tequila shots or a good few bottles of wine... So, can I hold it together tonight? Day 12: Ok, fast forward to the morning after the night before and I feel terrible. No, not because I am hungover - I survived a birthday without drinking, but I feel as if I am hungover anyway. I'm super tired, lethargic and I have a headache. Am I hungover by association? Maybe a sympathy hangover? This is odd and entirely unexpected. Also, Google isn't giving me any answers! Despite my faux-hangover, I didn't give in to peer pressure and take a drink. So why on earth do I feel this awful? I was expecting to dance out of bed this morning with a smug look on my face knowing I'd escaped a hangover. I keep reading articles about people quitting alcohol and feeling bloody amazing - this is frankly the opposite. I have to admit that I'm not anxious though. I'm grumpy... but calm. Do I Need To Make Sober Friends? Day 16: With more than 50% of the challenge done, I'm pondering whether I need to find a bunch of sober friends. How do people socialize without alcohol? It's not like I'm going to ditch my friends or anything, but by being the 'sober one' on nights out, I get tired and boring pretty quickly. Also, drunk people look terrible to sober people. Gosh. Aside from the faux-hangover (I'm fully recovered now, thanks for asking) and the realization that my social life is centered around booze and only booze, let's talk about the good stuff. My health is in check, I'm mostly anxiety-free and I've got plenty of time for self-care, cooking, writing and whatnot. Also, my back account doesn't hate me. There's no waking up in a panic, worried about how much I spent last night. I feel good. Just not as good as I was expecting maybe. Well, I've still got 14 more days. Day 20: It's my twentieth sober day and the start of another weekend. At this point I'm dreaming of hot mulled wine... I just wrote an article on fall self-care and the topic of enjoying a book in front of an open fire with a glass of wine just won't leave my mind. Sounds totally idyllic, right? Last night my boyfriend asked me if I wanted to go to a bar. I said no. That's kind of how my Friday nights are now. It's almost like I'm waiting for this challenge to be over so I can go out and have fun again, but that's a terrible attitude to have. I CAN have fun without booze - that's why I've joined a book club, so we will see how that goes. As for my anxiety... I can't recall feeling anxious this week which is bloody amazing. I'm feeling healthy, confident, and hangovers aren't holding me back! Day 22: Uh oh. I had a few (five) drinks last night. We went out to a gig and the mood caught me to order a glass of prosecco and then some. But, I was happy drunk! I didn’t get loud, rude, or sad, and that has been a problem in the past. As for my anxiety, I wasn’t really hungover the next day and we even woke up kind of early to go mushroom picking the forest. I’ve come to the conclusion that drinking every so often is fun, but I don’t need to make a negative habit out of it. Are you doing a sober challenge or sober month? If so, I’d love to hear your story! Leave a comment below.